Startups are relying more heavily on savings and credit cards and less on two once-common sources of funding, bank loans and home equity, according to a Wall Street Journal analysis of new government data. The data, released as part of the U.S. Census Bureau’s first Annual Survey of Entrepreneurs, provides a rare window into the financing challenges facing young firms and the lingering effects of the financial crisis. The survey, conducted in 2014, asked the owners of roughly 290,000 businesses with employees what sources of capital they used to start or initially acquire their business. Tighter lending standards and the real-estate bust continue to haunt small businesses. For instance, bank financing was used by just 12.3% of firms that were less than two years old at the time of the 2014 survey. By contrast, 18.4% of six- to 10-year-old businesses and more than 20% of older firms used business loans from banks or other financial institutions to get started. “The firms that are having the hardest time are the youngest firms and the smallest firms,” said Ann Marie Wiersch, a senior policy analyst with the Federal Reserve Bank of Cleveland. A 2015 survey by seven regional Federal Reserve Banks found that 58% of firms two years old or younger couldn’t get all the financing they needed. The typical amount needed to start a business, roughly $50,000, has changed little over the years, but new technology has allowed many firms to do more with less. More than 26% of the youngest businesses started with less than $10,000 in initial capital, up from 14.2% of companies 16 years or older. Personal and family savings have long been the most common source of startup financing, but the portion of business owners digging into their pockets has been increasing. Sixty-nine percent of firms that were less than two-years old relied on such savings as a source of initial capital, up from just 48% of firms started in 1998 or before. Many business used multiple sources of funding. It used to be that “bank loans and home-equity loans were it,” said Hal Shelton, a former chief financial officer who volunteers at Score, a nonprofit that mentors small-business owners. Mr. Shelton said he now often advises young companies to look for other sources of financing, including crowdfunding, angel investors and friends and family, or to “carve up what you do in smaller segments” that are easier to self-fund. Firms owned by women were less likely than those owned by men to get a bank loan and more likely to tap personal or family savings, according to the Journal’s analysis. Just 12.9% of Hispanic-owned firms and 15.2% of black-owned businesses used a business loan from a bank or financial institution to get started, compared with 19% of firms owned by whites. The collapse of the housing market made it tougher for many entrepreneurs to use their homes as collateral for a business loan and put the brakes on home-equity loans. Just 5.5% of firms that were less than two years old used home-equity loans, down from a high of 10.4% for firms started between 2004 and 2008. “One reason why new firm formation has been anemic is that prospective entrepreneurs don’t have this surplus of housing equity they could tap into,” said Steven Davis, a professor at the University of Chicago’s Booth School of Business. As an alternative, more business owners are piling up credit-card debt. 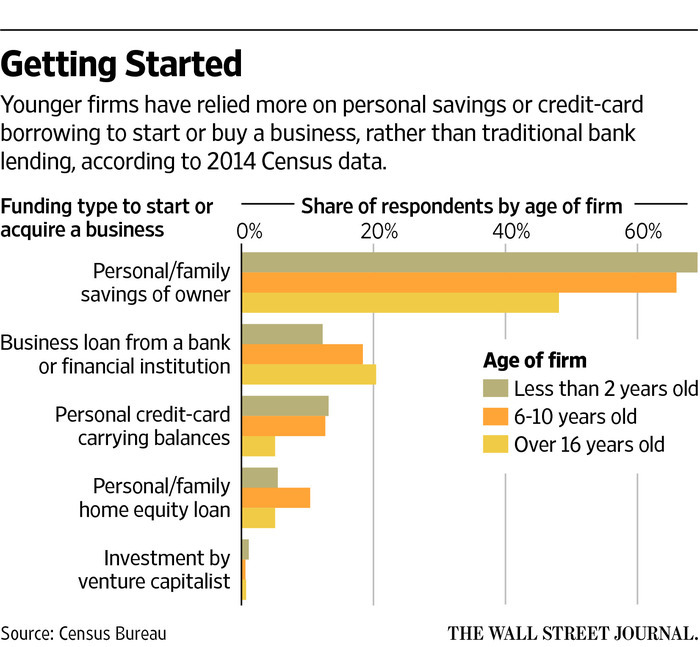 Personal credit-card balances were a source of startup capital for 13.2% of the youngest firms, versus just 5.1% of firms that were at least 16 years old. Russell Lundstrom, co-founder of Simple Smart Science, took out 18 credit cards when he launched the Denver-based creator of natural health supplements in 2013. “At the time, it was the quickest and easiest form of financing we could get,” said Mr. Lundstrom, whose balances ran as high as $131,000. With rates on personal credit cards averaging more than 15%, according to CreditCards.com, some analysts worry about the high cost of this debt. Because credit markets remain tight, “young firms are using this very unattractive source of financing,” said Alicia Robb, a Senior Fellow with the nonprofit Kauffman Foundation.